What if you have just won the match and walking proudly out of the court and meet the other person, who has just lost the match. You think he will also storm out of the court in anger and grab his water bottle but, instead you find him picking up his phone and checking in the mistakes that he had made during the match. Now we have new range of tools available in market which will allow you to check on the speed of a pitch, the arch of a basketball toss, the quality of a serve and the speed of a pitch, the strength of a putt. These tools are not meant for professional players or even touring golfers. These professional level tools are meant for using as part of the casual sports, starting from a beginner’s level to league level. So what makes this gadget so unique? It is the technology behind these tools which is mainly the amalgamation of increasingly affordable and small sensors such as gyroscopes and accelerometers. Every smartphone is loaded with these sensors giving boost to the developing fitness tracker industry. These sensors have already the total experience biking and running by coming up with different apps like Strava and other wearable apps like Fitbit. 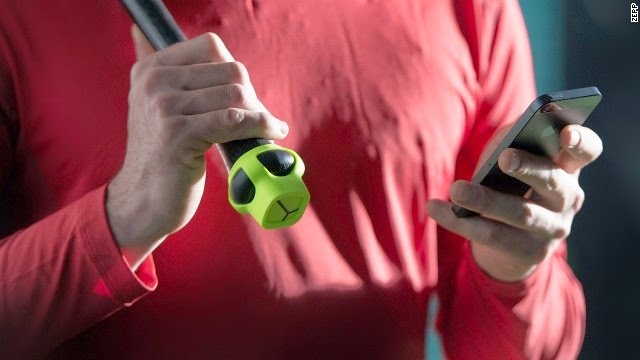 Now, companies are installing these unique sensors in different kinds of existing sports equipments like running shoes, tennis rackets, golf clubs and basketballs. Similar technology is being used by Babolat, which has been making tennis rackets for nearly 20 years. Year 2013 saw a completely new kind of racket being launched, which was priced at $ 399 called Pure play drive. This was the very first kind of connected racker having a trio of sensors hidden in the hollow handle of the racket which has the ability of tracking down the vibrations and the movements of the user. The sensors have the unique ability to track the exact spot where the ball touched the racket, the spin was given by the players and the force it hit the racket. All these statistics are sent to smart phone app that will reflect this through easy diagrams. The app has been equipped to track even the length of the game and even the total shots, misses and hits. Similar types of tools are coming up for different range of sports. Another example will be the 94Fifty Basketball even though looks like real ball, it has the ability to measure the intensity of dribble, the arch of each shot, and the speed as well. Adidas has also developed football which has the ability to collect information about every kick. But the main point to remember is that these sensors are meant for practice matches are not for the team games. Professional athletes have always relied on the phone camera and now even the beginners are starting to depend on the smart phone cameras for a quick slow motion replay. One of the biggest challenges is that these sensors need to turn the raw data into understandable information. Well now people can expect every action of their sports activities to be tracked with the increasing usage of sensors.